Huge news for spelunkers: Israel just dethroned Iran for ownership of the world’s longest salt cave. After two years of rapelling, burrowing and charting their findings, researchers have determined that the Malham salt cave at the tip of the Dead Sea stretches a record-breaking total of 6.2 miles underground. Malham is located between the famous Dead Sea and Mount Sodom, in one of the saltiest, most arid regions of the entire planet. When (rare) rainfall dissolves salt and filters underground, it creates a delicate labryinth of salt crystals. That process of erosion happens way faster for salt caves than limestone caves (consider the difference between pouring water on a pile of salt and pouring it on a pebble), which prompted geologists from Hebrew University to assemble a team of more than 80 volunteers to explore the site over the last two years. But the expedition also had a very practical purpose, providing researchers with a rare glimpse into weather patterns that predate Antiquity. Larger caverns, for example, indicate a period that experienced greater rainfall, which might’ve had a positive impact on agriculture, which might’ve helped human beings eat, which might’ve fueled the creation of nearby cities … etc. While you’ll undoubtedly want to see the stalactites and crystals for yourself, you can’t enter the cave just yet. It’s still an active research site (scientists plan to release a complete map of the cave a couple months from now), and beyond that, you’d have to navigate a whole lot of tight surface shafts and passages to get down there. Reporters and photographers who toured earlier this week could only enter with the help of experienced guides. Still, you can get to the area outside the cave, which has its own storied history, albeit five-or-so-thousand years more recent than the 7,000-year-old cave. 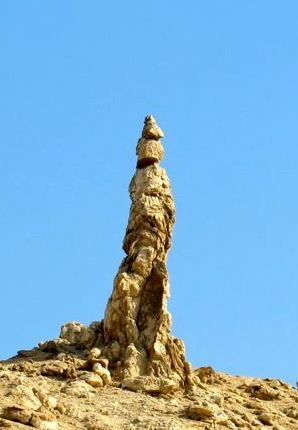 Above the entrance to the cave is Lot’s wife, an irregular pillar of salt named for the Old Testament figure who looked back at the city of Sodom after being instructed not to (how dare she!) and was promptly turned into salt. We’ve seen more humanoid-looking rock formations, but fair enough. Make sure to pack a lot of water, and have a float in the Dead Sea once you’ve completed your hike — an opportunity that might not be available to tourists for much longer.